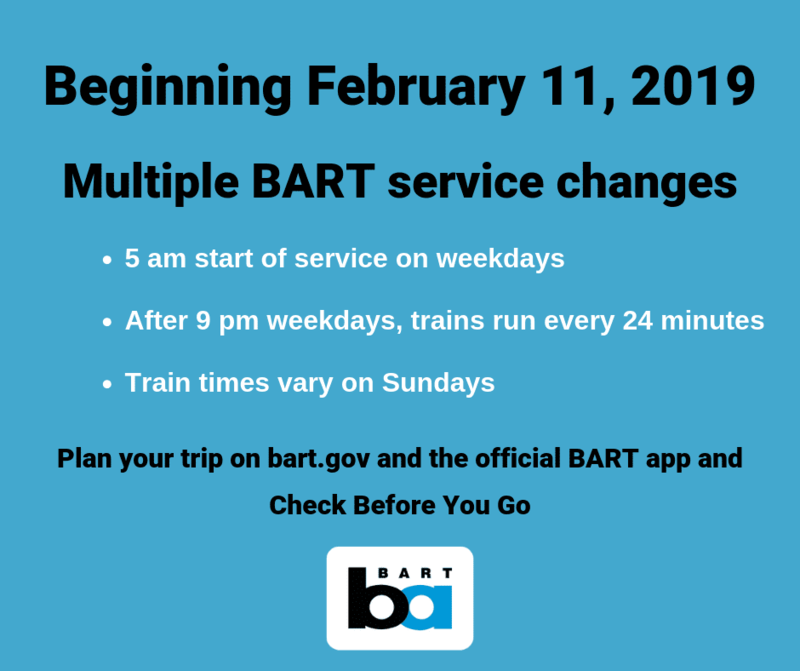 Beginning February 11, 2019, BART will shift its start of service from 4am to 5am on weekdays to allow extra time for a critical seismic retrofit of the Transbay Tube. This change will last for the duration of the 3.5 year-long project. About 2,900 riders enter the BART system in that first hour of service. A robust alternative bus service plan called the Early Bird Express has been developed for the 4am hour. The Early Bird Express alternative bus service plan establishes 15 new bus lines to run between 3:50 am and 5:30 am in both directions between stops. There will be 7 transbay routes, 5 East Bay routes, 2 San Francisco/Peninsula routes and a Contra Costa County route. The bus network will serve 21 BART stations and the Temporary Transit Center in San Francisco. Visit www.BART.gov for more information and full Early Bird Express schedule, fact sheet, and fare info.